“Thank you for cleaning my carpets. It looks really nice. 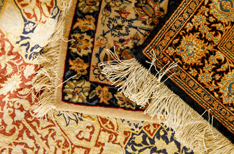 All of our carpet cleaning, area rug cleaning, Persian, and Oriental rug cleaning methods produce amazing results to leave your carpets clean, soft, fluffy and dry in minutes. Regular maintenance of your carpets and rugs is key to protecting your investment. The major carpet manufacturers recommend a professional cleaning once every 12 or 18 months to maintain a hygienic and aesthetically pleasing appearance. Regular care for your carpets and rugs is imperative for those suffering from allergies or if you have small children or pets. At White Glove Cleaning – Janitorial we use carbonation and ingredients copied from Mother Nature to make your carpets fresh and clean again. Our Carpet Cleaning process generates natural carbonation and produces millions of tiny, effervescent bubbles which penetrate the carpet fiber, dissolve dirt and stains quickly, and act as tiny propellants that actually lift dirt to the surface for extraction. Feel secure knowing our core cleaning solution is completely non-toxic and safe for kids & pets. Our carpet cleaning service starts with a deep vacuuming of the entire area. We then use a pre-spray treatment to break up dirt and other residues, followed by a deep scrub. The moisture is absorbed by our Bonnet system, leaving your carpet almost dry. Our extracting process available upon request. Trust us with your oriental rugs, wool rugs, sea grass rugs and any other fine rugs. We provide the finest possible cleanse and most satisfying results. Our system provides a thorough, gentle and effective cleaning without damaging the fibers in your rug. Copyright 2019 • Website Designed by Jantris Marketing Services, LLC.